Patch 1.018 is the latest non-Steam patch. The Steam version is already fully patched. Disable Perspective View to avoid rendering and stability problems. Enabled by default; listed as "monitor sync" in-game. 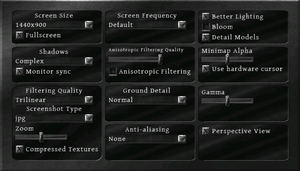 Higher FOV settings will cause black areas around the edges due to culling. Change r_fov 60.0 to the value you want. 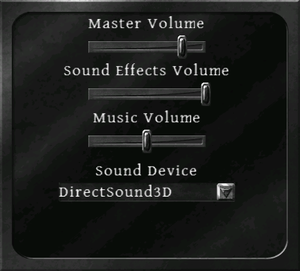 Master, Sound Effects and Music. No voice acting; all dialogue is shown as text. Game is muted and paused when focus is lost.